Mango Pickle! Is your mouth watering? Very few (like my husband) can resist the siren called mango pickle. There is are no words to describe how it feels to crunch into a freshly made piece of Mango Pickle, delicious and crunchy, sour and pungent at the same time. Well, a mango pickle need not be just pungent you can have them sweet too like Gor Keri a Raw/Green Mango Pickle made from Rajasthani Pickle Masala. In the time when we were kids, the pickle was made at home under the eagle eye of Ajji or Granny and the preparations were elaborate. For mango pickle, the season was of course summer and the bottles or barni as they are called were washed and rewashed then wiped and dried in the sun. Then the next day the mangoes were brought, washed and dried. Then they were cut on a clean and dry cutter. The keyword was clean and dry else the pickles will spoil. The way the mangoes were cut is different from region to region. In the Vidharba where we stayed the hard endocarp was chopped up and used in the pickle but Ajji discarded it. In general, the mangoes are salted then the spices added, mixed. Then oil that was heated to a smoking point was added after it had cooled thoroughly. Mixed well and were matured by exposing the bottles to sunlight for up to two weeks the pickle is kept covered with muslin while it is maturing. Sadly this is now a dying tradition we do not have the time or patience for the elaborate procedures and end up using readymade masala to make pickles or buy one off the rack. But today in my last post for Condiments of your Choice I have made the pickle masala from here. You can make and store the masala for your use or buy the readymade masalas that are available in the market and make your pickle. The methodology is same. Here I have used 1 kilo of raw mangoes as my basis but you can scale it down. 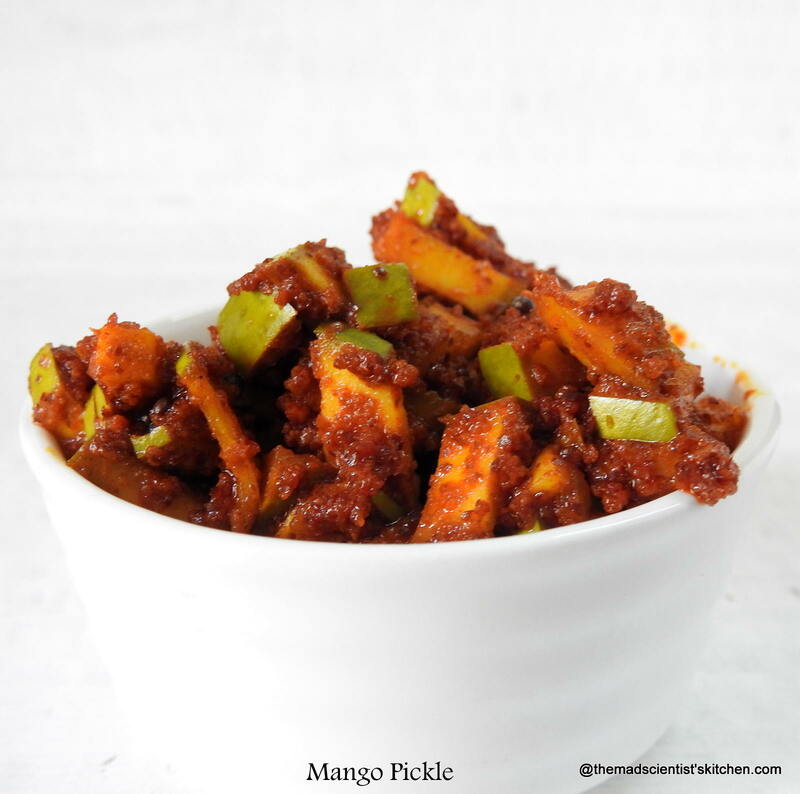 Make delicious Raw/Green Mango Pickle this season! Wash dry and sun the pickle bottle. Also, wash dry and cut the mango with a clean and dry cutter. In a big bowl add the mango pieces, salt, haldi and the masala and set aside for about half an hour. Meanwhile heat the oil and splutter the mustard seeds add the hing after mashing it up. Add the cooled oil to the mango mixture and mix well. Transfer to the glass jar. Cover and let it mature in the sun for 2 weeks. This is my pickle masala link. In case after transferring the mango pieces the mango pieces are not submerged under the oil. Heat and cool some more oil and add to the pickle bottle. In case you do not plan to preserve the pickle satr eating it immediately. I love the clicks , they make me drool ! Gone are the days when young girls would spend so much time on pickling , our elders had loads of patience and time . Looks super sinful Archana, won’t mind that pickle right now! love your pickle masala recipe. The mango pickle looks very tempting. Slurp slurp, omg this is a real torture, wish i get a super huge bottle of this pickle from u.
Mango pickle anytime with anything!! Looks droolicious!! Drooling here.. I just love mango pickle and feel like having with curd rice now ! Priya dig in with ghee and hot steamed rice. The best dish in the world. Wow… Raw mango pickle is a favourite and this one looks yumm.. Drooling.. Your picture of mango pickle makes me drool. And you are right its really mouthwatering. Superb share. I love crunch in the pickle, so eat only fresh mango pickle. Your pickle is making me drool uncontrollably. Ritu this is just the Ritu for it. Enjoy. Pickle is one of our family fav dish which we used to eat with our daily meal & this looks so yumm, very easy recipe too, bookmarked it !! 😀 I love this pickle mixed with hot rice and homemade ghee.Drool. Archana, my first time here, and yes I’ll keep coming again and again! I’m salivating looking at the picture! Will wait for mango season to start in Lahore to try this recipe. ???? Hi Maria Nasir! Thanks for the kind words and glad to meet you.Hope you get great mangoes immediately now to make these pickles. Drooling here! Love freshly made mango pickles and yours looks delicious! Great to meet another pickle lover :D.
What a lovely summer recipe that is Archana. Mango pickle looks spicy, tangy and absolutely mouth watering. Yummy.. love it with curd rice. Looking at the post and the write up, I can surely guess you love making pickles, just like me. With mangoes in season, this is what I would be also doing, in fact just made a draft post couple of days back with my batch of kairi acchar. Seasonal produce has to be enjoyed, I am with your husband totally on this. Varan Bhaat, toop ani lonche is the absolute comfort food. Making pickles and then storing them is definitely an art, well written recipe notes too. Thanks, Vidya but I love pickle and rice more than anything else. Mom’s pickles are the best pickles. Just in time.. Perfect for summer.. Can make a big batch and store for the coming months!! Mmmm me drooling at the thought. This pickle looks so very tasty and super delicious. It would go so well with parathas and curd. True Jagruti. I miss those days. 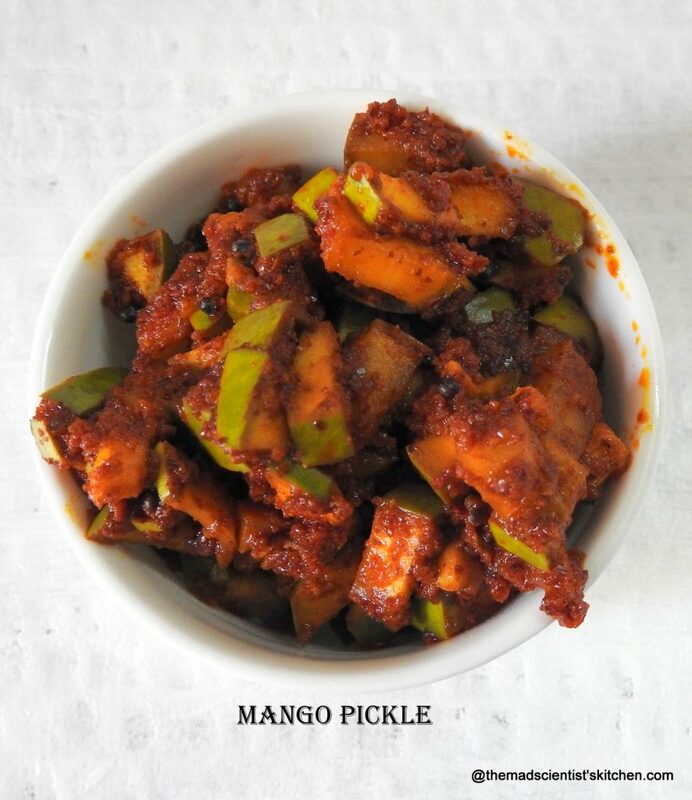 My weakness is Mango pickle…it’s around midnight and I’m drooling over this yummy pickle…yours is a different approach to the pickle..would love try out sometime!! Please try Padmaji and let me know. True it is instant love.Thanks. You have a good collection of pickles.. Mango pickle looks yum apt with curd rice..
Lovely pickle and this post is in just in time Archana! Salivating with this post and pics. The name mango pickle itself make me drool. This look real tempting and full of mouth watering flavors ???? I love these instant mangi pickle recipes. Really quickly made and serve immediately. Yours have come out so well. mouthwatering cliks. Delicious pickle, looks so good. I like having mango picked with some aloo Puri. Make it so yummy???????? Don’t remind me of the differnt combos Avin. Drooling at the thought. The mango pickle looks so inviting di.. droolesome share..and best part is the recipe sounds quick and easy ! !